LadyFace is in situ awaiting our arrival, swigging Fanta and eating Hula Hoops from her fingers as retro music plays. Clad in leotard, tutu and silver cowboy boots – and with a cardboard box on her head – it's a joyously childlike scene. This box, together with a cardboard sign and washing airer stacked with more cardboard boxes, are the first nod to her refuse-based props and set. It's a sweet and sour mixture of girly fluffiness and everyday earthiness, which complement one another. 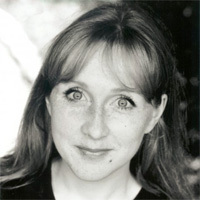 We meet eight characters through the medium of monologue, all played by Lucy Farrett. Each character is clearly marked by costume and props made from bin bags, tin foil, carrier bags, cardboard and similar. I love the use of recycling in this (or any) show: eschewing a throwaway culture and promoting creative re-use, there's a charm to this Blue Peter style of design. Playful and fun throughout, there's a good pace to the piece. Each monologue is separated by lighting changes and upbeat music, as Farrett dances her way through her quick changes. Repetition also helps us follow the thread of the characters, and as their stories progress we begin to anticipate and recognise their idiosyncrasies. The show is slick – especially considering that I saw a preview performance – and that's because Farrett is a fine actor. Totally in control, she has versatile voice skills, and the energy and presence to engage the audience for a full hour. Most of her characters are new creations with a couple of exceptions, notably some very good mimicry and interpretation of Audrey Hepburn. There is light and shade in the work, particularly in the vocal tones and timbres, and comic stereotypes are presented alongside more unusual inventions – such as a diminutive cat who becomes a reluctant YouTube sensation. But I found myself wanting a little more variety; some of the characters are quite similar. In shorter bursts this wouldn't matter, but for a full show I'd have felt more engaged if we'd visited more extremes – a much older woman perhaps, or someone with a particularly strong physicality, or even a man. The writing, although not laugh-out-loud witty, is quite inventive – and there are some very funny moments, not least the warm, climactic ending of the show. For me, in the context of the Fringe, this didn't offer anything especially new or out-there, but I could easily imagine it as a mainstream television show – with the familiar format of characters and call backs that has proved so successful over the years. This review of a show at the Edinburgh Fringe 2017 was published on Thursday 10 August.